This week the DMA unveiled the work Everything is Everything (2006) by the artist Koki Tanaka, which will be on view in the Concourse for the next five months. The work of Koki Tanaka takes shape primarily as video and installation that explores the relationship between objects and actions. His videos record simple gestures performed with ordinary objects—a knife cutting vegetables, beer poured into a glass, the opening of an umbrella—in which seemingly “nothing happens.” Yet, through their repetitive composition and heightened attention to detail, Tanaka’s videos compel us to take notice of the mundane phenomena of daily life. Latent patterns and geometrical forms emerge out of Tanaka’s work, and otherwise ordinary objects are transformed, providing an epiphany of sorts from moments of everyday life. The eight-channel video installation Everything is Everything was first created for exhibition at the 2006 Taipei Biennial. For this work, the artist and two assistants spent a total of eight days recording their interactions and interventions with readily available items, including hangers, cups, towels, an air mattress, and toilet paper, all found around the city of Taipei. The physical properties of these objects were tested (a metal hanger is stretched to its breaking point) or their uses were expanded (a level placed on two table legs becomes an impromptu hurdle). 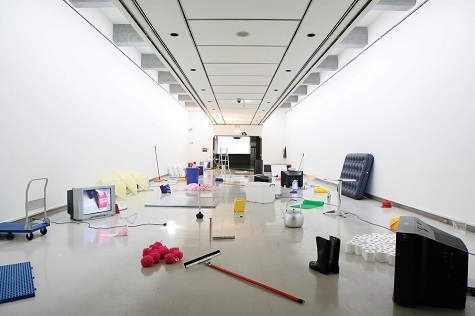 Tanaka and his assistants experimented with these objects multiple times, both indoors and in public, and their exploits were compiled into eight distinct video loops ranging in length from 1:19 to 1:50 minutes. 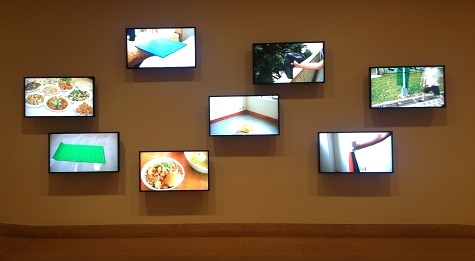 Tanaka’s tightly cropped framing of each scene often features the performers from the neck down or removes them from the shot altogether, thus focusing the viewer’s attention on the objects and the simple, repetitive acts being performed. In her canonical text, Passages in Modern Sculpture (1981), art historian and critic Rosalind Krauss begins the book’s final chapter with a film by Richard Serra, Hand Catching Lead (1968), in which the artist’s disembodied hand tenaciously attempts to catch pieces of falling lead. Krauss reads Serra’s film as characteristic of minimalist sculpture in the way that it “exploit[s] a kind of found object for its possibilities as an element in a repetitive structure.” The repetitive nature of the actions in Everything is Everything, combined with the use of inexpensive, mass-produced materials, highlights an affinity Tanaka’s videos share with the logic of minimalist sculpture and process art of the 1960s. 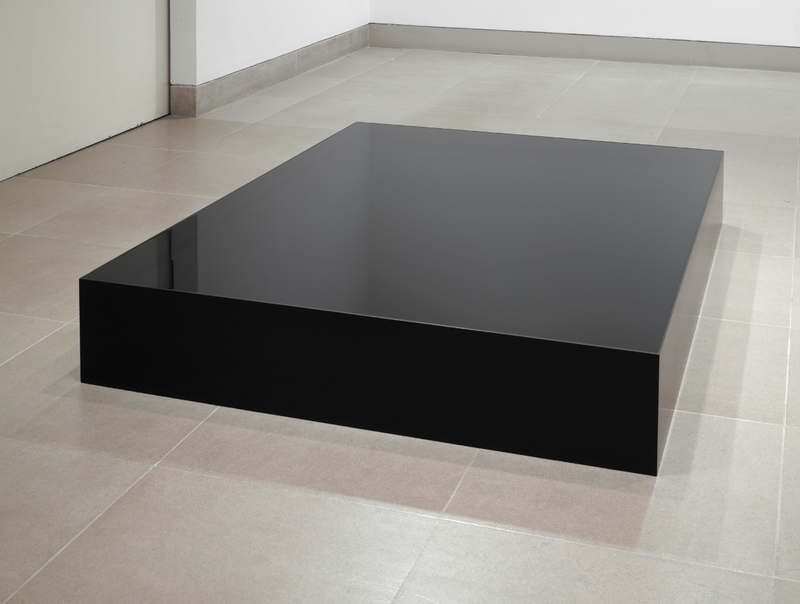 Similarly, Tanaka’s repetitive use of the objects in Everything is Everything alludes to Serra’s Verb List (1967–68), in which the artist listed eighty-four verbs such as “to roll . . . to crumple . . . to drop . . . to scatter” as a means to relate actions to “oneself, material, place, and process.” Tanaka’s object-oriented work is indebted to minimalism as well as to the legacies of Mono-ha and Arte Povera, as evidenced by a shared interest in exploring the physicality and formal qualities of quotidian objects through processes of encounter and repetition. Koki Tanaka was born in Tochigi, Japan, in 1975, and currently lives and works in Los Angeles. He received his MFA from Tokyo University of the Arts, Japan, in 2005 and has since been the subject of solo exhibitions at UC Irvine University Art Gallery (2012), the Yerba Buena Center for the Arts, San Francisco (2010), and the Museum of Modern Art, Gunma (2008). 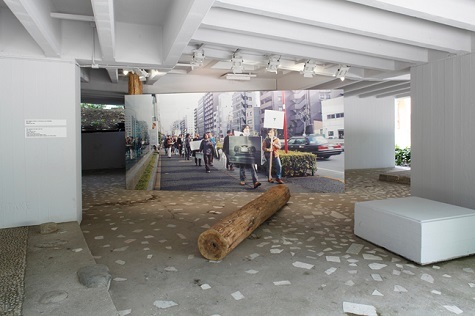 Recent group exhibitions include Made in L.A. at the Hammer Museum (2012), the Yokohama Triennale (2011), and Making is Thinking at the Witte de With, Rotterdam (2011). Most recently, Tanaka was selected to represent Japan in the 55th Venice Biennale, for which he received a special mention. Gabriel Ritter is The Nancy and Tim Hanley Assistant Curator of Contemporary Art at the DMA. 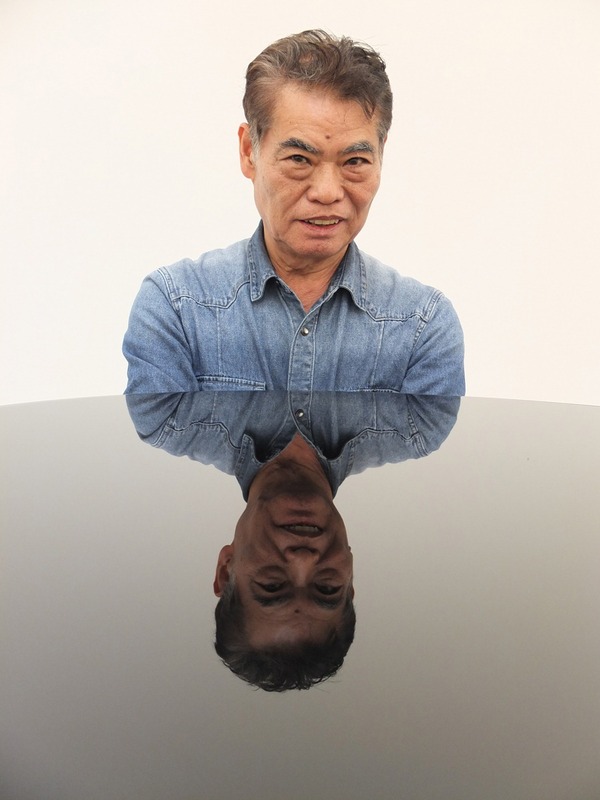 For the past few months, Japanese sculptor Nobuo Sekine’s (b. 1942) works have been on view in the Marguerite and Robert Hoffman Galleries. For those of you who haven’t seen them yet, or are still wondering what these works are all about, this blog post is for you. Phase No. 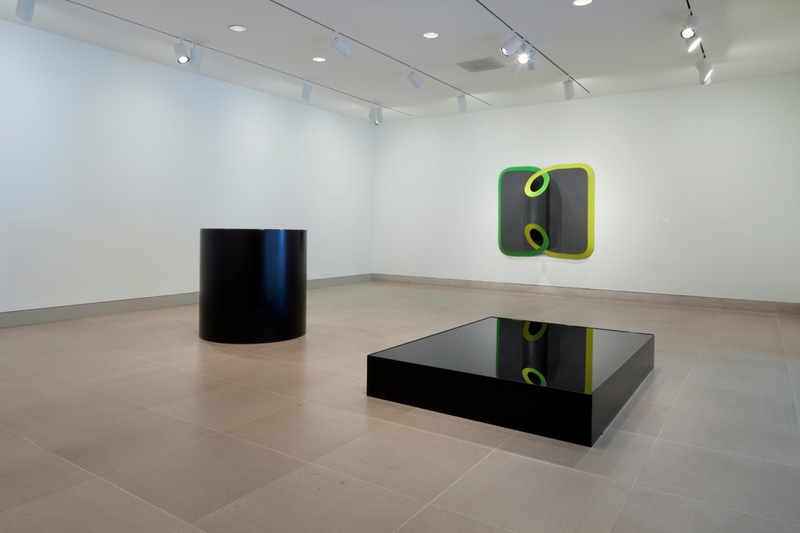 10 (1968), Phase of Nothingness-Water (1969/2005), and Phase of Nothingness-Cloth and Stone (1970/1994) were originally created in the late 1960s, and what they have in common is the word “phase” in their title. In order to understand these works better, let’s first talk briefly about global art trends in the late 1960s and then explore the idea of “phase” that so interested Sekine. In the early 1960s, artists such as Richard Serra, Donald Judd, and Robert Morris made a clear shift away from the gestural quality of abstract expressionism (Jackson Pollock) and embraced a more minimal aesthetic. Minimalist art was intended to discard the emotionality of the past along with all non-essential formal elements related to the art object. The resulting work took shape as hard-edge geometric volumes created with industrial materials that showed little-to-no evidence of the artist’s hand in its making. 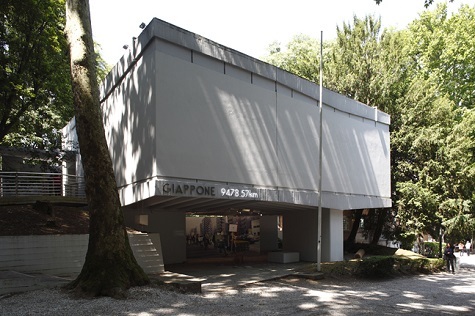 As minimal sculpture evolved, artists in the late 1960s began moving outside the white cube of the gallery and museum space to create large-scale outdoor works that used the earth itself as the medium. Known as Land Art, this movement was closely associated with the work of Robert Smithson, Michael Heitzer, and others. It is within this transitional moment between minimalism and Land Art that the work of Sekine Nobuo and the Mono-ha movement in Japan came into being. The term Mono-ha (meaning “School of Things”) encompassed a variety of different forms and approaches, but at its core the short-lived movement explored the encounter between natural and industrial objects. Using natural materials such as stone, wood, and cotton in their unadulterated states, in conjunction with wire, light bulbs, glass, and steel plates, the work of Mono-ha artists presented objects “just as they are,” with the hope of bridging the gap between the human mind and the material world. The tenets of Mono-ha are most clearly embodied in Nobuo Sekine’s famous outdoor sculpture Phase Mother Earth (1968/2012). 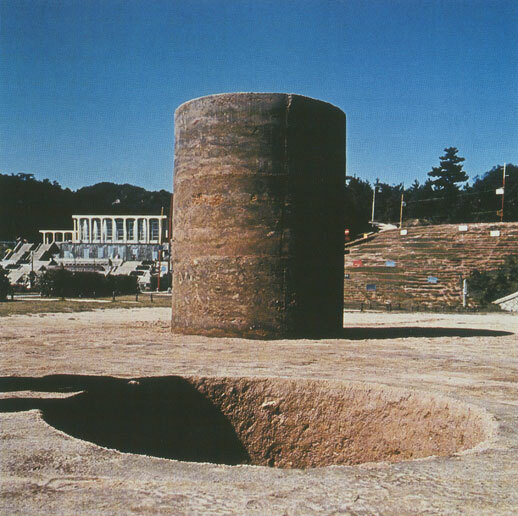 Often cited as the beginning of the Mono-ha movement, Sekine’s sculpture consists of a 2.2 meter-tall cylinder of earth positioned beside a hole of the exact same dimensions. While clearly in dialogue with other American and European Land Art of the time, the modest scale of Sekine’s work invites the viewer to experience the earth simply as earth rather than as a grand artistic gesture writ large across the landscape. Sekine’s Phase-Mother Earth is closely related to the artist’s previous sculptures exploring the mathematical field of topology. Topology is a field of spatial geometry in which space and materials are considered malleable and can undergo countless transformations from one “phase” (state) to another without adding or subtracting from the original form/materials. In Sekine’s words, “a certain form can be transformed continually by methods such as twisting, stretching, condensing, until it is transformed into another.” This idea of manipulating form and space can be seen in Sekine’s work Phase No. 10 (1968) currently on view at the DMA. 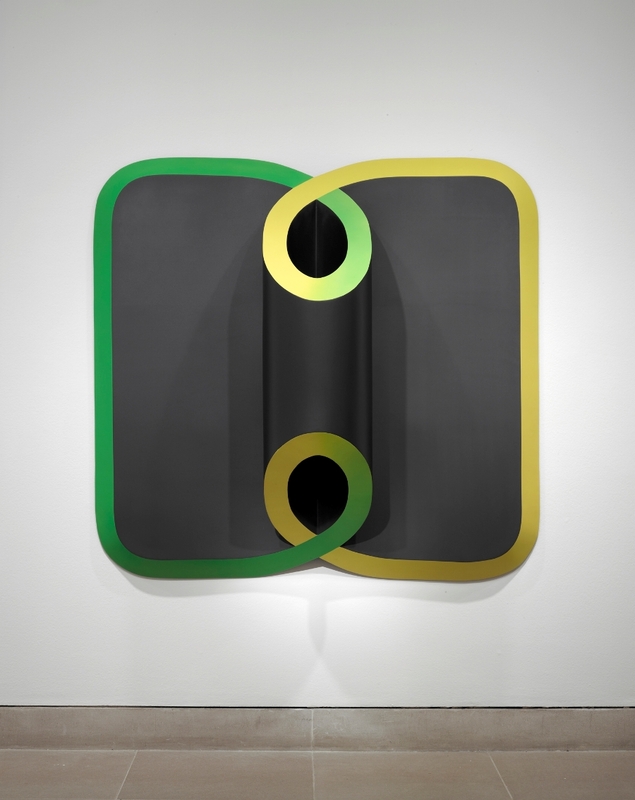 This wall-mounted sculpture closely resembles a Mobius strip, and when viewed head-on it appears to be a flat, curvilinear design, but when viewed at an angle the sculpture juts out from the wall, creating an optical illusion. I hope this blog helps explain some of the fascinating (and at times complicated) ideas that inform Sekine’s sculpture. The exhibition closes Sunday, so plan your visit to the DMA before it’s too late! Gabriel Ritter is The Nancy and Tim Hanley Assistant Curator of Contemporary Art at the Dallas Museum of Art.